Think waterfalls, dinosaurs and erupting volcanoes! 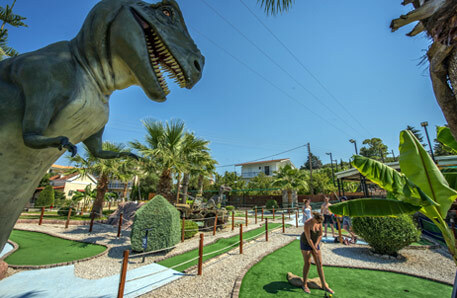 Located along the main street in Tsilivi, this fantasy-themed mini golf centre makes a fantastic trip out for families and couples alike. It’s open by day and night, with 4 different courses to choose from - not to be missed! Tsilivi Waterpark For a splashing day out, why not try the Tsilivi Waterpark? There’s plenty to keep everyone entertained, with a variety of slides including a space bowl, the boomerang and racer slides. For anyone looking for more relaxation, there’s also a wave pool and lazy river as well as a splash pool for younger children. Water Village Water Village is located in the village of Sarakinado, 4 miles from Zante Town. You can expect a thrill a minute with plenty to do for all the family. Slide head first on a mat-racer side, get lost down the black hole, and try the Free Fall if you dare! Younger children are catered for too with a dedicated Splash Zone and there's a lazy river for a more leisurely ride. Water Village makes a fantastic day out. Carreta Fun Park The Carreta Fun Park in Kalamaki has various rides, games and water-based activities for kids. The park is located in the centre of the resort, with various cafes and restaurants nearby where you can stop for lunch.